The safety of players is always a top priority when playing any sport – especially those that are high-contact. Injuries don’t only happen during competitive matches though. As we reported in May, more than half of all concussions that occur in high school and college sports happen in practice. 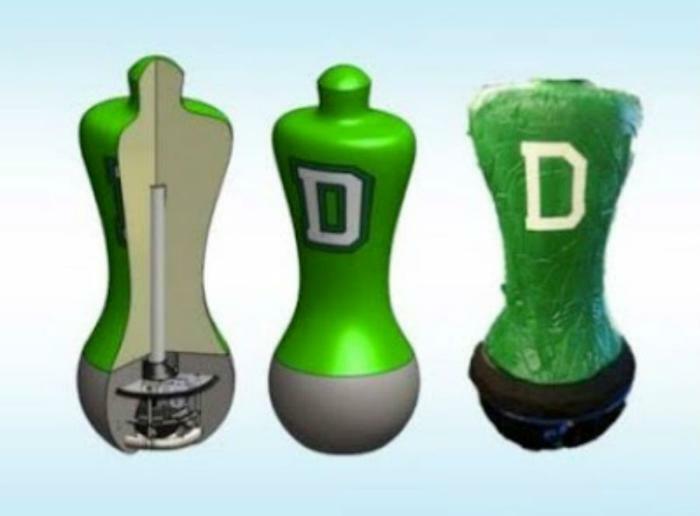 Luckily, researchers at Dartmouth College have developed the “Terminator”, a mobile device that allows players to practice at full contact without the high risk of injury. The full name of the device is the “Mobile Virtual Player” (MVP). It looks like a standard tackling dummy, but it is designed to replicate the size, weight, agility, and speed of another football player. It has been modified with several features that make it great as a practice tool. It is wheeled, self-righting, and can be controlled via remote control. While many might think that the dummy couldn’t possibly replicate in-game conditions, they would be dead wrong. Dartmouth recently released a video that showcased just how mobile the prototype is. The developers hope to improve on the existing model in the future by making it look more like an actual player. It will also come with pre-programmed routes and drills that can be used for tackling, blocking, running, and passing. Most importantly, though, is that it is very safe. Up to now, athletes that wanted to practice at a high level had to run the risk of hurting one another in the process. These athlete-on-athlete collisions were the highest cause of concussions and other injuries. The MVP helps to reduce this risk by minimizing head and neck injuries. The project of making a safer alternative to full contact practices started nearly two years ago at Dartmouth. Buddy Teevens, who is the head coach of football at the college, reached out to the Thayer School of Engineering in the hopes that they could develop useable technology that could reduce injuries. Many prototypes have been tested since then, but the MVP is the latest success. President of the college Phil Hanlon applauds the work that has been done, citing that it illustrates several Dartmouth priorities, such as innovation, experiential learning, entrepreneurism, and engineering. Athletes that have tested the MVP acknowledge that it is a superior piece of machinery. Madison Hughes, who is an alumnus of Dartmouth and the U.S. team captain for the 2016 Summer Olympics team, praised it for its agility and sprinting capabilities. The devices will soon be marketed to pro, college, high school, and youth athlete teams. The researchers are awaiting the approval of their patent, and hope to market it through the Dartmouth Entrepreneurial Network. They have not determined a price yet, but estimate that the devices will cost $3,500 to manufacture.